Synopsis: This talk reports on the development of a Little Big History of waves. 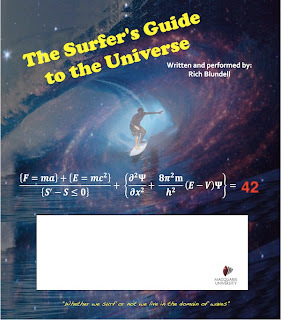 The project is based on my 90-minute stage presentation called The Surfer’s Guide to the Universe which explores the nature of waves as a fundamental component of the universe. In the Surfer’s Guide we trace waves back to their source, all the while, referring to the great equations of physics. Excerpt: Whether or not we surf, we live in the domain of waves. I know this because in between the sets of waves, a surfer has time to ponder them. As a scientist, I have calculated wave functions, amplitudes, and periods, while as a surfer, I have simply felt their thrill, power and pummelings. In this project I tell a "little big history" of the wave as contemplated by a scientist and surfer. It is a performance imbued with quantum physics and photons, meteorology, music, and marine geology. I'll carve a line that reconciles conceptual knowledge with the lived-experience of waves. It is science, but not above the inevitable poetic "stoke" that comes with experiencing a wave on its terms; wet. Organization: International Big History Association Conf. Cosmosis I: A live spoken-word performance with projected scientific visualizations and affective musical accompaniment. More Info: A poster presentation that summarizes some of my early research findings of the benefits of teaching/learning Big History. Presente at the Gordon Research Center conference of science visualizations and radical learning. First use of the term "Interlocking Knowledge".